Introduction; Part I. Competition and Market: 1. Three ski lessons for budding economists; 2. Containers conquering the world; 3. Casinos and one-armed bandits; 4. The great game of international gas; 5. The glamorous shipping market; 6. Intermezzo: the Earth is not that flat; Part II. Competition and Differentiation: 7. Coca-Cola versus Pepsi: the war is over; 8. A cruise in a gilded cage; 9. Lego's winning game; 10. Breakfast cereals invading space; 11. Four wine-economics tasting sessions; 12. Intermezzo: no end of differentiation; Part III. Competition and Innovation: 13. Uberizing the razor; 14. Coaches, BlaBlaCar and trains; 15. Apple versus Google, season one; 16. Apple versus Google, season two; 17. Super Mario can die, but like Nintendo he has several lives; 18. Intermezzo, on a theme of disruptive innovation; Part IV. Competition and Redistribution: 19. Bidding for soccer TV rights; 20. For and against fixed retail book prices; 21. Gyms running on empty; 22. Phantom economics at the opera; 23. Uber, or forget about taxis and drivers for a while; 24. Intermezzo on the redistributive effects of competition; Conclusion. The changing face of competition today. 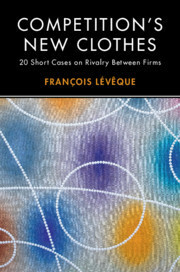 François Lévêque is Professor of Economics at Mines ParisTech, Université de recherche Paris Sciences et Lettres. He is also a part-time Professor at the Robert Schuman Centre for Advanced Studies, European University Institute, Florence. He founded Microeconomics, a Paris-based economics consultancy, which has recently joined Deloitte.